THE MOST WANTED MAN IN HISTORY is Osama Bin Laden. Obama’s foreign policy advisers, Robert Gates, General James Jones, and Admiral Michael Mullen, point to “intelligence” that Osama is “hiding” in Pakistan. Yet this same “intelligence,” after many months of American air attacks and special forces operations into the badlands of the Pakistani-Afghanistan frontier, has failed to capture Osama. 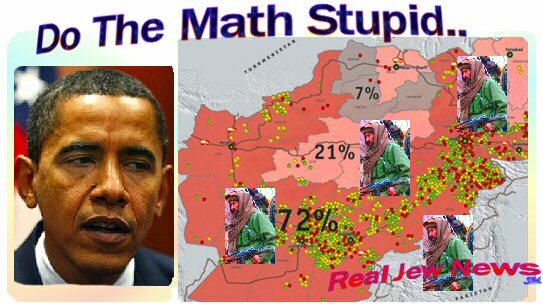 Obama, calling Afghanistan, “the central front in the war against terrorism,” preaches that he wants to “ensure America’s security” by sending an additional 20,000 troops to the Afghanistan/Pakistan border. On December 11 2008, Defense Secretary Robert Gates, arrived in Afghanistan. While visiting a US military base in Kandihar, he told reporters that he “hopes to have all 20,000 American troops in Afghanistan by summer.” This will increase the number of American troops to 58,000 from the current level of 34,000. Pakistan views Obama’s threats regarding hunting for his ‘useful terrorist’ through their borders as a pretext to destabilize their country. 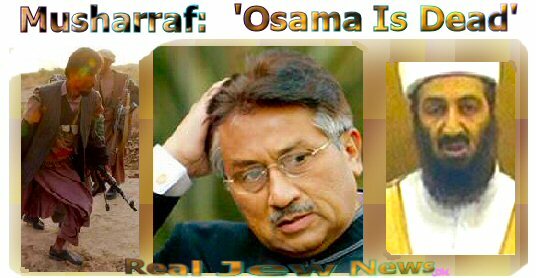 Former Pakistan President Musharraf, who stated numerous times that Bin Laden is dead, announced in January of 2008 that Pakistan would not hunt for Bin Laden - thus setting up Pakistan for America’s imperialist designs in that unhappy region. ON DECEMBER 7 2008, Taliban chief Mullah Mohammad Omar warned Western forces to take a “golden opportunity” to leave Afghanistan before thousands of their troops were killed in the Islamist group’s renewed insurgency. Omar also warned that a planned increase in US troops would fail to curb violence and would instead fuel the insurgency. The war in Afghanistan has brought on the worst bloodshed this year with 267 allied military deaths and at least 4,000 Afghans killed in the first half of 2008, about a third of them civilians. Omar asserted that any increase in civilian deaths would help boost the Taliban’s insurgency. “The more you destroy our people’s houses, the more you martyr our people, the more you will face the wrathful reaction of our mujahideen,” Omar said. Given the Taliban’s high morale contrasted with young American soldiers who have little or no ideological convictions, Obama will doubtless be in for a long, protracted war. The Taliban belong to the largest ethnic group in the country, the Pathans - 40% of the population, with millions more of them in adjoining Pakistan. Presently the Taliban have a “permanent presence” in three quarters of Afghanistan and are tightening a noose around the capital, Kabul. “American military and civilian agencies are being retrained to carry out counter-insurgency missions to achieve democratic state building in Asia and the Middle East. It is absolutely clear that we will be involved in nation building for years to come.” View Entire Story Here. Spreading America’s secular religion of democracy, which has been propagandized ad nauseum by the Jewish-occupied press, has become America’s missionary activity abroad. But rather than building nations, we are instead, ‘attacking’ nations. 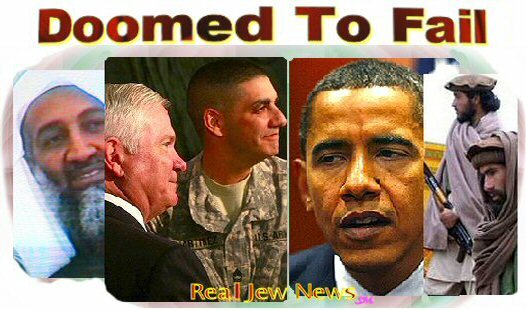 Is this what Obama is being told to do by his Zionist handlers? This article, Why Obama Will Fail In Afghanistan, is a kind of “prophecy,” though I do not claim to have a prophetic gift of “predicting” the future. The forecast postited by the title and body of the article is based on both the Taliban’s growing strength throughout Afghanistan, their ideological/religious battle, coupled with young American lads who really don’t know what their fighting for. 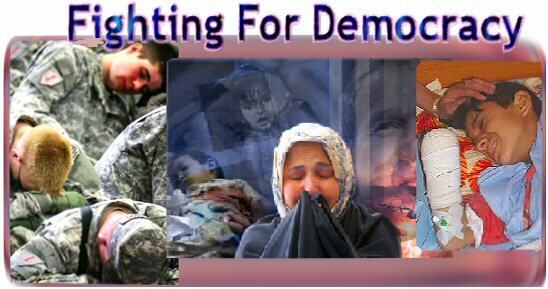 Many of them, (and I have met them and their parents), come home from the battlefront with deep psychological problems. Not so the Taliban! On another note, I want to draw your attention to the new Donate Function at the top of the article. Since Pay Pal succombed to the ADL’s threats and banned RJN, I and my Web Manager spent two days searching and then many hours, formating the new Donate feature. Please consider making a donation as running this site and the overall ministry is very costly. The pair of pictures of Obama and Omar is incredible. Obamaquin even looks about ready to kiss Judeo fanny with the yarmulke on his bean. Omar with his classic Afghani features looks resolute but calm, strong but not overbearing…he’s ready to “look Obama square in the eye” as master of the situation, but Obama has already sold his soul to the Jews. You can see Omar’s soul in his face-I would take him to be an honest and forthright man who would act consistently with what he says, and says what he means. Obama is a golem. Native Americans would have called him “wasitchu”, which is translated as “white eyes”, but carries the meaning of a bleached, colorless soul. It’s a complicated and disciplined pattern, and it has to be wrapped properly every day…it’s not like a hat that is plopped on the old head. That turban signifies that Omar is internally disciplined and profoundly patient. He is ready to wait generations to get Zionist Talmudistan out of his beloved Afghanistan. Produced and directed by Irish filmmaker and former BBC producer Jamie Doran, the film tells the story of thousands of prisoners who surrendered to the US military’s Afghan allies after the siege of Kunduz. According to the film, some three thousand of the prisoners were forced into sealed containers and loaded onto trucks for transport to Sheberghan prison. When the prisoners began shouting for air, U.S.- allied Afghan soldiers fired directly into the truck, killing many of them. The rest suffered through an appalling road trip lasting up to four days, so thirsty they clawed at the skin of their fellow prisoners as they licked perspiration and even drank blood from open wounds. Mossad - name any crime and Mossad has been there and done that crime. In reply to Kath Juliane message. I agree with native Americans who call Obamma wasitchu. God. I sensed there was something not right with this man from the first time I saw him. The ancient tactic used by the Afghans to squeeze swaggering, bragging foreigners is coming much into evidence today: they put slow, even, bulding pressure on the primitive road network, gradually choking off traffic while the loudmouth foreigners and their paid puppets issue press releases in Kabul. The guerrillas supply themselves (as was done in Vietnam) from the foreigners’ largesse of food, medicine, weapons and ammo.Afghans have a strange inner mindset–they ‘like’ it when foreigners arrive spouting whatever propaganda they want to spout. The Afghans then fall to work exploiting the outsiders, whom they see as a visible, active resource. Work for them and get paid? Yes. Steal from them? Yes. Kill them and take what they have? Yes. Tell them what they want to hear? Yes. Middle Eastern newspapers said Osama was dead in 2003 from some disease. He always denied he had anything to do with 911 anyway. The British crawled through the Khyber Pass on their hands and knees, starving and coughing blood–twice! Yomama is in for a king-size shock when he ups the ante in Afghanistan and attacks the Paks. The Mumbai based group alleged that Al-Qaeda is a front organization of CIA and MOSSAD. “There is enough evidence that the Al-Qaeda is a front organization of the CIA and MOSSAD. The Bush junta has used the bogey of terror and of Al Qaeda to justify his unending and ever expanding Global War on Terror, which is only a means of capturing the resources of the world and of establishing the sole hegemony of Israel in West Asia,” said the group of activists and intellectuals. The group is holding a press conference in Mumbai on Wednesday to “expose the links between Al-Qaeda and the CIA-MOSSAD”. I am sorry to hear of paypal’s cowardice, not to say I would expect any different. 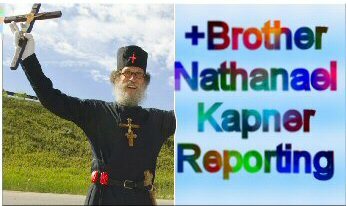 Another excellent article, Brother Nathanael. [The online FBI “10 Most Wanted Fugitive” poster of OBL is dated issued as of June 1999 with last revision date as of November, 2001, a slightly different version of the “Wanted Terrorist” listed on Muckraker’s, above. Although absent the issue/revision date they both have virtually the same content. This wanted poster is a legal forensic piece of evidence that the DOJ would use to establish the chain of “probable cause” leading to the arrest of a fugitive. Since Nov 2001, the FBI has had insufficient evidence to link OBL to day911 and to receive a grand jury indictment on this particular crime. To: Right Honourable Stephen Harper, Prime Minister of Canada, Honourable Stéphane Dion, Leader of the Liberal Caucus, Honourable Jack Layton, Leader of the N.D.P. Caucus, Honourable Gilles Duceppe, Leader of the Bloc Québécois Caucus and Members of Parliament. …As Canada is sovereign country, we must conduct our own official independent inquiry into the events of September 11, 2001. We can not rely on United States intelligence/opinion to make Canadian military decisions. The Canadian Government was intelligent enough to keep Canada out of Iraq, but the government should have launched a full, official investigation into 9/11 before unofficially declaring war in Afghanistan. The latest on our honest and good boy Rahmo..$$$$ Pray for him. US initial official motive of WAR FOR TERROR was bringing evil forces like Al-Qaeada and master minds of 9/11 to justice. This motive was later on changed to fight for democracy and liberty against dark forces of Taliban and extremism. USA critics have stated various motives of WAR FOR TERROR which vary from Iraq/Afghanistan occupation, sectarian/regional violence, oil monopoly, denuclearization of Pakistan, map redrawing of Pakistan and clash of civilization. However WAR FOR TERROR architects will try their best to conceal the real motives till final conclusion and achievements of their objectives. At the same time, Pakistan state and its establishment has tailored US official version WAR FOR TERROR for its own interests. These interests vary from economic aid, military hardware, legitimacy and opportunities for corruption loot/plunder, dealing with iron hand to any political, economic issues, crisis or rival. US banks and financial markets during last century have been designed and structured around cycles of wars, chaos and violence across the globe away from US mainland. Starting with WW I (initiated by Non-state agents), each US recession/depression alternate with some war in some other part of the world away from US main land. USA during last century planned thoroughly and laid the necessary groundwork for the growth of the most powerful defense/aerospace industry worth trillion dollars. As a result if we sum up today technological might of US, it includes only Banking/Finance, IT and Defense/Aerospace Industry. In these industries US firms have monopoly and do not have ant parallel/equal competitor in whole world (including G8 countries). Each war, conflict or crisis creates direct consumption for US defense/aerospace industry. Each war/crisis is followed by construction and public work, which is mostly done by US firms/cartels. Examples are Europe (after WW II) and Iraq reconstruction recently. Each war, conflict and map redrawing has created new US dependant states. Examples are Saudi Arabia and Pakistan. Saudi Arabia is depended on USA for last seven decades for all external and internal threats. Pakistan during its existence for last six decades is dependant on USA for military hardware and financial aid due to similar on going wars, crisis and breeding violence across its Western and Eastern borders. Wars, crisis and violence also create favorable and monopolistic business/trade conditions for most of US firms and MNCs. Similarly wars, violence and crisis also result flow of capital from whole globe to US main land, which has remained safe from any war, violence and crisis during last century. Whereas US has been remained direct/indirect sponsor and actor in each war, violence and crisis during last one century. Therefore wars act as agents for pulling US economy out of recession due to enhanced public spending, reconstruction work after war and preferential monopolies over trade/resource. Transparency international Bribe payers index 2002, ranks defence industry as the 2nd most corrupt business sector- just ahead of oil and gas sector but behind the public works and construction sectors. On home front home, wars also divert attention from structural flaws in US economic/financial system. Unemployment and inflation in US reached record heights during great depression of 1930s. Great depression was followed by World War II (in 1940s). Similarly in economic recession, US embarked wars and adventures away from main land like Korean, Vietnam and Kuwait Wars. (For relationship between US economic depression and Wars, kindly refer to Fig 4.4 Page 73 & Fig 6.6 Page 116. The Economy Today-8th Edition by Professor Bradley Schiller). Oil is traded in dollars and most of the Arab oil dollars are saved in US banks considered to be safe havens. WAR FOR TERROR resulted turmoil and chaos in Arab countries, Iraq, Afghanistan and Pakistan. This turmoil escalated oil and commodities prices exponentially during last several years. Hence WAR FOR TERROR was indispensable and crucial bailout package for US Banks and Financial Markets. As an example Pakistan oil import bill was US $ 2 Billion in 2000 whereas in 2007 Pakistan oil import bill shoot upto US $ 12 Billion. So in this way additional US $ 10 Billion were diverted to US Banks and financial markets through Arabs from Pakistan economy. Just consider oil import for whole world and billions/trillions US $ directed from the whole globe toward US banks due to escalating oil prices. Without WAR FOR TERROR and oil price escalation US Banks and Financial Markets would have been failed much earlier than 2008. Moreover required bailout package would have been much greater than US $ 700 Billion. Recent decline in oil prices after US bank bailout package also give an idea about structural flaw in US banking/financial markets and its dependency on oil dollars. At domestic front, fear environment of WAR FOR TERROR also made US $ 700 billion unobjectionable to US Taxpayers. Similarly after Arab-Isreal 1973 and Kuwait War oil prices escalated, which helped US banking systems and financial markets. WAR FOR TERROR regional turmoil had also resulted drag on US rival economies of China, Russia, India, Arab and Iran. These countries are almost half of the globe. As US economy was unable to remain competitive and correct its own structural gaps. Therefore WAR FOR TERROR was initiated for restricting and limiting US rival economies growth. Hence the basic motivation of WAR FOR TERROR is chaos and anarchy in the whole globe through Islam and Muslim regions which are safest, vulnerable and easiest targets for US. Other various factors ranging from Al-Qaeada, Taliban, extremism, violence, oil monopoly, denuclearization of Pakistan, map redrawing of Pakistan and civilization clash are not root causes of WAR FOR TERROR rather these all are natural outcome/effects of the WAR FOR TERROR. Therefore these are secondary in nature and mostly misleading. As an example if there is car accident due to brake failure. After accident wind screen, complete body and wheel steering system are damaged. Now in this case wheel steering system is not the root cause rather it is affect of the occurrence. Pakistan political, defense decision makers’ and military commanders committed suicide by joining US WAR FOR TERROR for saving Pakistan from direct US confrontation and carpet bombing. PPP political leadership in Islamabad is claiming that during last seven years, WAR FOR TERROR has become Pakistan war for state survival. These claims, doubts, fears, conspiracies and assertions have been debated at multiple levels in Media, parliament and mass level. Various explanations, justifications, motives and reasons are presented for WAR FOR TERROR. Disinformation/disorientation campaigns for local/international establishment agenda has increased exponentially during recent times. Such disinformation/disorientation campaigns are paid, sponsored and engineered by local/international establishment for creating justification of ethnic cleansing of Tribal Pathans on one hand by Army and other side by US Drones. Pakistani press/electronic media like establishment considers/present themselves as CHAMPIONS OF TRUTH, DEMOCRASY, and JUSTICE. Various anchors pretend asking tough/hard questions and saving Pakistan from Western/India. However media at best are manipulating and comprising the truth by showing half picture of crisis. Most of the time media avoid context and conceal motives of the ongoing crisis and chaos in Pakistan. Media can never tip-toe out of the false perception minefield that they have allowed themselves to be lured into by the CIA, Pakistani ruling establishment and architects of WAR FOR TERROR. TV Anchors most of the times are bounded by policy, life threats, job fears, temptations, easy going attitude, incompetence and lack of quality research on social science. Any TV channel prime motivation is money, revenue, coverage, ads and sponsors not truth. As an example, Media have never been able to ask simple questions about worst case scenario if Pakistan is invaded by US just like Iraq/Afghanistan. Are there any war plans for such worst case scenario? Will Pakistanis suffer same fate of Abu Gharaib and Bagram Jail? Avoiding confrontation with US is understood, however it does not exempt Pakistan State and Armed Forces from preparing War Plans for emerging war threat similar to Iraq/Afghan. In 1990s, none in whole Islamic world could imagine about possible US occupation of Afghanistan. However it is almost impossible to fight two wars simultaneously, thousands miles away from mainland, without military and strategic planning spanning over decades. One of best known example is 1967 Arab-Israel War. Israel Air Forces were practicing offensive air operation against Arab since 1957 for almost 12 years. Whereas Arab Media and their puppet leadership were sleeping like prostitutes. Now once we have established that turmoil and chaos is basic motivation for WAR FOR TERROR. Now question arise will dramas similar to so called terrorism 9/11 and weapon of mass destruction be staged for invading other countries. Will US invade Pakistan or sponsor civil war in Pakistan. Has India committed suicidal mistake like Pakistan (in September 2001) by joining WAR FOR TERROR for settling scores against Pakistan? Will India be able to pull out itself toward safe/straight policy of Iran or Turkey by not sponsoring civil war along its 1800 KMs long border alongwith Pakistan? These are hard and tough question. It is not possible to precisely answers in white and black. Nonetheless temporary failures/setbacks in Afghanistan or Iraq may only delay US aggressive plans against Pakistan. Pakistan and whole regional actors overall interests should provide the framework for rethinking about evolving philosophy of war and changing enemy/threat perception. Pakistan should prevent conflict/war with US or India as a strategic priority since this would allow concentrating more on socio-economic development. Pakistan war plans, threat perception, security policy and defense doctrine have been revolving around India as traditional enemy during last fifty years. It was based on two pronged policy of conventional military buildup and nuclear deterrence. However past fifty years Pakistan conventional threat perception is incompatible with evolving war philosophy and battle planning after 9/11. Iraq and Afghanistan have totally changed war initiation patterns and rules of engagements between various states and non-state actors. Therefore in short term, Pakistan as deterrence should adopt a simple war strategy of Guerilla Warfare for responding to any US design for expanding WAR FOR TERROR into Pakistan. Pakistan have revamp all its war games/plans accordingly. In long term Pakistan has to gear up its defense policies and boost air power as future wars initiated by hypothetical non state actors will be exclusively between asymmetrical adversaries. This fear of facing US will not only boost our national integrity but in long term it will also add new dimensions and life to our defense industry in private sector and self indigenization. Perception of strong enemy means strong commitments for nation survival and history is full of example where nations excelled only due to fear of some strong enemies just. Further it will send a new form of message to super powers and their policy makers while planning invasion on Pakistan. It will delay any possible aggressive plans against Pakistan. Germans after humiliating defeat and strict restrictions on Defence/Aviation industry as result of WWW I were able to raise quite effective/capable Defence/air power during WWW II supported by its aviation industry based in private sector within short span of 5 to 7 years only. The same engineering and technological base is still helping German industries, which are best in the world. By capturing of only 2 % of world aircraft/Defence market, Pakistan will have foreign exchange worth billions, create thousands jobs and make us self reliant in Arms Power capabilities. After capturing 2 % of the Defence world market, we will not need IMF, World Bank or conquering music, dance and film industry. The purpose of the article was to discuss the WAR FOR TERROR and options for Pakistan Defence. This discussion is important, most critical, to the future of Pakistan and whole region. It should be reiterated that this is not intended to be a stand-alone study. Rather, these comments and suggestions are meant as a contribution to the continuous work of a doctrine and in particular to respond to evolving philosophy of war and new threat perspective for Pakistan and whole region in terms of economy and security. As such, while the article seeks to highlight issues that were considered to be of the most importance, there is no pretence towards comprehensiveness or detail. However, while it is not possible to get into the nitty gritty of every particular suggestion, attempt were made to define options and solutions at level of detail that underscores the practicality of the suggestion. However, it should be stressed that most important element are the broad directional changes recommended in the article. Of course the Afghan war was really about securing control of the oil in the Caspian Sea basin and the building of a pipeline to bring the oil across Afghanistan to the West, and it was all planned well before 9/11 - all that was needed was a casus belli (a “new Pearl Harbour”, as it was put) which 9-11 rather conveniently provided. Given that, however, I don’t see why we have to be starry-eyed admirers of the Taliban in general or of Mullah Omar in particular (if you really feel that romantic about him, Kathjuliane, then you had best get yourself fitted out for a burkha and learn how to be a non-person fit only for breeding, which is how the Taliban view women). As far as I’m concerned, the pre-war Taliban regime was unarguably vile, and if as a consequence of the war the Taliban had been got rid of for good then, for me, that, at least, would have been one good thing to have resulted from a war which was undoubtedly fought for entirely different and non-altruistic reasons. Remember that the peculiar Taliban ideology is not native to Afghanistan, but was rather invented in the Saudi funded Wahhabist Madrassas of Pakistan during the 1980s. The impression that I get from news reports is that the people of Afghanistan, however much they dislike their corrupt government and the “bomb anything that moves just in case they are Taliban” Americans that keep it in power, would not welcome the return of the Taliban to power. Even if it now seems that it could be inevitable, let’s not actually wish it upon them. Please realize everybody that this Comments Section is EXTREMELY POPULAR. Thus when formatting your comment, do not make difficult-to-read “reader unfriendly” LONG comments. Also, please space out thick texts into multiple paragraphs which I am continually doing to many posts on the edit function. I don’t have time to do this any longer. Next, PRO- Hitler, Nazism, Aryianism, WILL NO LONGER BE POSTED on our site, Real Jew News. Hitler was an OCCULTIST, and ANTI CHRISTIAN, murdering many Serbian Orthodox Christians, and Polish Catholic priests. Christ came for ALL NATIONS, and White Supremacist comments will be immediately deleted. Last, many of you have a venue to express your views here on the Comments section. But a good number of you do not pitch in to keep Real Jew News AND this Comments Section online. I appeal to you once again to consider making a donation to OUR site, Real Jew News, as we all are in this togther. The Afghan War is about opium. The Taliban, being devout Muslims, forbade the growing and exporting of opium poppies after they took power. The CIA smuggles it into America and mankes emormous profits from it. The CIA needs the money to feed their illegal schemes, so the war restored their opium profits back to them. Before in a comment on another article you mentioned that Peter and Catherine the great were bad for Orthodoxy how come? Michael Raphael Johnson at http://www.rusjournal.com/ takes this stand point as well. He also takes the stand point that Ivan the Terrible he gotten a bum rap that he was basically smeared by the oligarchs ruling Russia at the time when he tried to limit there power. Do you know who Edward Bernay’s is? He is Sigmund Freud’s cousins and the father of PR putting Freud’s theories into practice and credited for coming up with the Nuremburg trails, duck and cover school techniques in schools during the Cold War, getting women to smoke, putting fluoride in water, overthrowing governments as Communist sympathisers, etc. It’s interesting how his techniques have been implemented in modern warfare. Serbs were the new Nazis during the Balkans wars and Russia is a neo-communist state in the resent Georgia conflict. On CNN Russia was portrayed in red and groups had planned in Israel and Europe to hold post communist Estonian style linked people marches until it became clear that Georgia attacked Russia. When find info on Edward Bernay’s I will email it to you along with pictures. It’s a lot to Process!! What a unique and powerful contribution you are making to America in this critical time. I look forward to reading more and more of your site. There is seldom a single cause for doing anything, and it may be that what you say about opium is part of the reason for the American invasion of Afghanistan. It is, however, based largely on speculation and suspicion, whereas the reasons that I have given for the war in my comment are well documented and can be researched on the Web. Also you praise the Taliban as being “devout Moslems”, so presumably, it wouldn’t bother you (or might please you) if their Wahhabist doctrines were embraced by the whole of Islam. And since Islam is a universalist religion that sees it as its duty to Allah to convert or subdue the whole world, then I guess that you might like to see all of us eventually subject to Wahhabism. If so, then, as a lover of human freedom, I have to say that you scare me more than any Zionist. I heard some interesting information on Russian TV. The number of drag addicted victims in Russia is 30 000. So, each year in Russia die 30 000 Russians age 18-30 and the economy loses several billion rubles. The highest in Russian history. One of the reasons for this tragedy turned out to be the large import of drugs in Russia from Afghanistan. Since 2001 year, after US (the bankers and the Group) invaded Afghanistan and Iraq, the production of drugs in Afghanistan has increased more than 40 times and the biggest part of it goes North to Russia….. So we can see the hidden agenda of the bankers. Not only making $$$$ but also destroying the future generation of Russia… Very smart. And by the way not only of Russia. It makes perfect sense Brezinski/Obama would want to focus on Afghanistan. Geographically it’s next to Central Asia and Iran so they can push opium into these areas and also have a base on which militants can launch attacks and incursions. Real Jew News Comments Section Is STILL Extremely Popular BUT Will Not Be So Due To OFF TOPIC Comments & TOO LENGTHY Comments. Comment: There is reasonable argument that this was an intentional satanic sign of cabbala magickal sign to the world. Contrary to Al-Rubaie’s denials, the cell-phone digital recordings of the execution where the guards are recorded taunting Saddam, which hit Arab news and were publicly broadcast throughout the world. Although Muslim law prohibits autopsies, hence no autopsy reports, after his death [built in deniability], videos also emerged of his corpse body-bagged in the ambulance/hearse which clearly showed a 2 or 3 inch wide gaping wound in his neck just under the jaw about where the left carotid artery is located. It was passed off as “rope burn” from a badly executed hanging. There were also unusual wounds on his face. The number of six stab wounds in and of itself may or may not be magickal cabbala symbolism, but there is more that points to the demonic than just “coincidence” or mere spite of cruel executioners. Primarily, Iraq [Babylon] is considered in the Talmud as being “of the Land”, or just as holy as the Holy Land itself because of the long-term presence of the elite racially “pure” Babylonian Jews. The Babylonian Jewry later relocated to the city of Baghdad after the Euphrates River radically changed its course away from the city of Babylon about the early Christian era, forcing the residents to abandon the ancient city for the new capital. The launch date of the Zionist invasion of Iraq was Purim of 2003, and the mission goal was to capture Baghdad in order to celebrate Jewish Passover in the main presidential palace of Saddam, which the press had pilloried as the megalomaniac “new Nebuchadnezzar”. Add to this, however, the peculiarity of the date of the execution which corresponded to certain significant holy days of the Jewish ritual calendar. Saddam Hussein was executed on Saturday, Dec 30, 2006, which that year marked the 9th of Tevet, the day before the Jewish “ASARA B’TEVET”. To the 10th of Tevet has been added events that are associated with the 8th of Tevet - namely, the “tragedy of the Targum Shiv’im”, the first translation of the Torah into Greek which the Jews now consider was “coerced”. “Targum Shiv’im” specifically refers to the Greek Septuagint, a translation of the temple copy of the Hebrew Scripture made at the request of King Ptolemy Philadelphius to the High Priest Eleazar about 275 BCE. It was the version of Scripture translated from the temple Hebrew canon under the oversight of the high priesthood used by Greek-speaking Jews and Gentile “God-fearers” of the Roman Empire, our Lord Jesus and the Apostles. The Septuagint was received into the Church in its Greek, Aramaic and Hebrew forms prior to the rabbinical Jewish canon established at Jamnia in 90 AD, where the Talmud also testifies that the canonical order of the Hebrew Scripture was changed in the rabbinic debates. Because of the Greek Septuagint, 10th of Tevet is considered as “dark” as the day of the Sin of the Golden Calf on Sinai, because it became the Scripture of the ‘minim’, “apostates”, “heretics”, meaning Christians in the Talmud. The Jews believe that “the literal translation of the Written Torah without the inseparable rabbinic Oral Law, opens the Torah to misunderstanding and distortion, the effects of which have haunted us throughout the generations”, as the demoniacs whine. And the 9th of Tevet - namely, the anniversaries of the deaths of Ezra and Nehemiah, who represent for Jews the restoration of Oral Torah study and practice and exaltation of rabbinic Sages, and the return of the woefully small numbers of the Judahites and Israelites to Eretz Yisrael from the Babylonian dispersion. In our time, an additional element was added to Asara b’Tevet - namely, it has been declared as Yom Kaddish K’lali - a day of saying Kaddish and remembering victims of “the Holocaust”. The rabbinical calendar is calculated such that Asara b’Tevet never falls on Monday or Shabbat. So, the Iraqi Sabbath-goyim carried out the execution, doubtless under the supervision of US-Israeli “advisors”, while Jews in the world were free to celebrate their Sabbath and secretly enjoy the perception that they had finally overcome “Nebuchadnezzar”, with Judeo-Christian Zionists spilling their own blood in Iraq for the privilege. What goes largely unreported is the persecution and martyrdom of the indigenous Assyrian Orthodox and other Oriental Christians of the region by both the largely Christian Zionist US forces splattered as “collateral damage”, and the retaliations against the innocent local Iraqi Christians by certain Muslims for the aggressions of the “Crusader West”. The Ashkenazim are happy both ways to see Christians dead, they’ve “triumphed” over the hated mystical Nebuchadnezzar and their Babylonian “humiliation”, and blissfully ignore the trampled blood of millions of innocents on their heads for the sake of their own Holocaust revenge in the cause of Greater IsraHell. My thanks for your including my previous posts. I was wondering if you will be exposing the LEE or Li (same “sound” when read) families in Red China (where Christians, and Muslims have been persecuted. A FACT!) which a part of the ILLUMINATI BLOOD. Thanks Bro, cause the Red Chinese influence in the State has been powerful as well, specially during George Bush Senior’s administration and his successor Bill Clinton. Shanghai, one of the largest business districts (matter of fact it IS a major city in China) is reported to be a JEWS’ haven now! 1. The latter (Red China) has the guts to challenge OPENLY the USA! 2. The Zionists in Israel, ALWAYS claim to be (and treated as) Class-A friendly nation by the moronic US Government et PentaGone(mad), but slowly and clandestinely has been trying to destroy the USA! Both Israel and China, at the end of the day WILL crush the Christians nation the USA! Trust me! Who sold one of the most tightly-guarded “export-controlled” hi-tech (made-in the USA), had been sold (on credit definitely) to Israel; but then sold to the Red Chinese? Israel of course! Hence, the rapid advance of the Red Chinese rocket guidance tech! Folks, BEWARE of the Red Chinese! Whatever you wanna say, AsWas, the thing is right now, you’re blaming and condemning the Taliban for what they have been doing for there country. They were protecting it you fool, from the imperialist American soldiers, However, in fact the whole America, is being controlled entirely by Zionists. i’m totally in agreement with Afghanistan and Opium Poppies. The comment you replied to this Afghanistan & Opium Poppies dude wasn’t making any sense at all. the Taliban & Islam have no intention to do whatsoever that you said. You leave from their land and the war shall immediately cease. But unfortunately for America for having people like you, AsWas, it is among the reasons that Zionists have the ability to control America, and fortunately for Zionists, they have people like you, AsWas as their puppet.